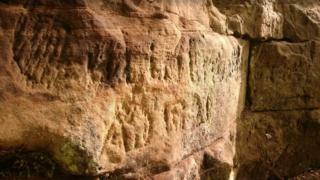 Graffiti marks made by Roman soldiers near Hadrian's Wall are being recorded before they weather away. Inscriptions in a quarry at Gelt Woods near Brampton were made by Romans who were repairing the wall and were discovered in the 18th Century. Known as the Written Rock of Gelt, the markings include a caricature of the quarry's commanding officer. Archaeologists from Newcastle University are producing a 3D record of the writings. They are working with climbing experts to drop 30ft down the quarry face to capture the markings using structure-from-motion (SfM) photogrammetry. The public used to be able to access the writings until the 1980s when a path collapsed. Historic England said the site is one of only a handful of Roman quarries in England to feature these kinds of inscriptions documenting rebuilding and repair work. It gives the names of men and in some instances their rank and military units. One inscription reads - APRO ET MAXIMO CONSVLIBVS OFICINA MERCATI - which translates as "In the consulship of Aper and Maximus". These were consuls or diplomats of the Roman Empire in early third century AD. What does the new graffiti tell us? One of the archaeologists at the site says it may depict an unfortunate accident. They've found a pristine relief of a man's head and shoulders, the name Gaius and an arrow pointing downwards. Is this a story about a fellow soldier falling off the quarry cliff? Or is it the ancient equivalent of a presentation slide, showing workers how to get the stones to Hadrian's Wall? They've also found a carving of a phallus, which was a good luck symbol in Roman times. It's a difficult job for the archaeologists, who are suspended 30ft (9m) down the quarry face and are being pushed and pulled into position by safety experts. The photographs they're taking will mean that the carvings can be seen by members of the public who are unable to visit this inaccessible corner of Cumbria. Mike Collins from Historic England said: "These inscriptions at Gelt Forest are probably the most important on the Hadrian's Wall frontier. "They provide insight into the organisation of the vast construction project that Hadrian's Wall was, as well as some very human and personal touches, such as the caricature of their commanding officer inscribed by one group of soldiers." Ian Haynes, professor of archaeology at Newcastle University said: "These inscriptions are very vulnerable to further gradual decay. "This is a great opportunity to record them as they are in 2019, using the best modern technology to safeguard the ability to study them into the future."